Last Post: Happy New Year…..
Shouts to everyone who has followed me on “The Weezy Chronicles” in 2009 (The REAL one, LOL). I promise to continue posting even more in 2010. I wish all of you a Happy Holidays and a Happy New Year. I leave all of you with these words…. New Gift: Merry Christmas Ladies…. Richard Mille timepieces are a luxurious and thematic extension of what sports cars would be if they lived on your wrist-at least that is the idea given the race inspired numerals and subdial registers. Your Porsche 911 can now have a garage stable mate that costs as much, but takes up much less room. Tonneau shaped with large proportions and technically inspired details, the RM011 Ti is your all purpose timing instrument for the track, boat, plane, or even your desk. Significant to this line of limited edition watches is their intended locale of sale. Swiss watches rarely get special versions for sale only in North America, but this is one of those rare occasions. As a celebration of the 2010 Winter Olympics in Vancouver, Richard Mille will make the entire limited edition set only available at American and Canadian Richard Mille authorized dealers-with just 30 pieces to go around. 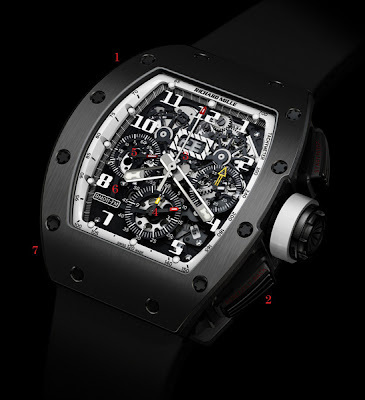 Those who miss out can get other versions of the Richard Mille RM011 watch. Bold in pictures and sexier in person, the watches by Richard Mille know how to pack an enthusiastic level of “wow” into each piece. The 40mm wide by 50mm tall case is in DLC (diamond like carbon) coated titanium for strength and scratch resistance. Night turns to day as the dark sheen of the case shifts to the bright white chapter ring, giving the RM011 Ti Americas White watch its name. Another white ring around the large crown helps assert the wintery white concept. 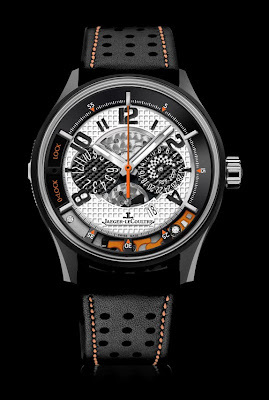 The subterranean clockwork under the transparent dial appears ludicrously complex-because it actually is. The watch features a series of useful complications including a 60-minute countdown timer, 12-hour chronograph, an annual calendar with a big-date window as well as a smaller numerical month indicator, and of course the time via large hands tipped with lume filled arrows. Countdown timers are rare on mechanical watches. A subsidiary dial counts down from 60 minutes while chronograph hands counts up. To accommodate the extra subsidiary dial for the countdown timer, Richard Mille was able to place both chronograph minutes and hour-counter into the same subdial. Completion of the racing theme includes a tachymeter scale (to measure speed with the chronograph based on a distance marker reference point) on the white chapter ring. Nevertheless, this latter function will doubtfully be used by any of the 30 people who will eventually adorn one of these-consider it cosmetic or vestigial at best. Reading the dial is remarkably plausible given the incredible ménage of details seen on or through the watch face. You may however be distracted by observing the Richard Mille Caliber RM011S automatic flyback chronograph movement in action. The non-static image can allow you to appreciate the harmonious gears working in unison as the watch operates. 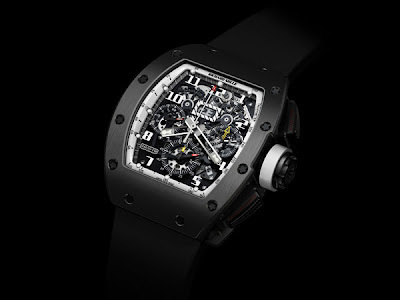 Price for this limited edition Richard Mille RM011 Americas White watch is $90,000. Saturday’s Night Live’s take on the “Jersey Show” reality show, funny as hell! Guess who’s back???? Ms. Vida Guerra, that’s right she is appearing on the Decemeber 2009 issue of Black Men’s Magazine. Not a bad way to close the decade, enjoy the pics…. This movie is looking good for 2010. Robert Downey Jr. reprises his role as the witty billionaire inventor Tony Starks a.k.a. Iron Man. The cast includes Mickey Rourke a.k.a. “Whiplash”, Scarlett Johansson a.k.a. “Black Widow”, Samuel L. Jackson a.k.a. “Nick Fury”, and Gwyneth Paltrow as Pepper Potts. The only change in the cast is Don Cheadle taking over for Terrence Howard as James “Rhodey” Rhodes a.k.a. “War Machine”. Check out the trailer and enjoy. Uniqlo announced today the +J Spring/Summer 2010 Collection. The line is a collaboration with fashion designer Jil Sander and was well perceived in its first season this year. “The season introduces fresh perspectives on volume, teamed with perfect harmony in fiber, color, optics, and touch. Experimentation is essential, but subtle, leading to new interplays of material and motion. Leaving sporty stereotypes behind, +J endorses functional elegance, dynamic textiles, and distinctive shapes. Softly articulated, silhouettes give free reign to movement and ease. Fabrics are straightforward, expertly woven, alluringly sculptured, neat and subtle. Initiating marriages of convenience between structure and fluidity, delicacy and determination, coupling strong characters for the common good. The collection quietly bridges the emotional and the formal, femininity and masculinity, experience and evolution. 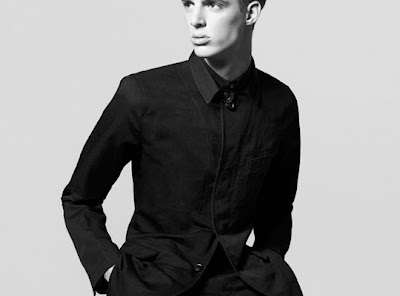 Luxury lies in inspiration and discreet perfectionism, applied to truly modern tailoring. Environmental concerns move to the heart of research, engaging in clothing that is both responsible and innovative. Nike Basketball MVP Puppets Are Back!!!! Guess who’s back????? The Kobe and Lebron MVP puppets in the case of the Mystery of the Missing VII. Well it now seems that the mystery has been solved, maybe. Check it out! I’m sitting with this mixtape right now, Drake is a PROBLEM. If you aren’t up on him yet then do yourself a favor and download the mixtape below so you can better your life….